How prepared are your patients for a severe hypoglycemic event? A severe hypoglycemic episode can take place anytime, anywhere. Help your patients be ready with GlucaGen® HypoKit®. It’s important for your patients to understand that untreated hypoglycemia may become severe and cause them to pass out. Prepare to treat them with GlucaGen® HypoKit®. 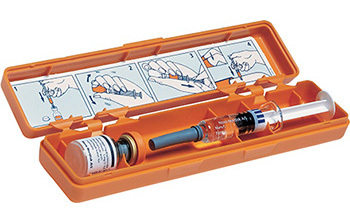 GlucaGen® HypoKit® comes in a bright orange case designed to be noticeable. It includes one vial of GlucaGen® (1 mg or 1 unit) and one disposable syringe with Sterile Water (1 mL) for Reconstitution. GlucaGen® is contraindicated in patients with known hypersensitivity to glucagon, lactose, or any other constituent in GlucaGen® and in patients with known pheochromocytoma or insulinoma. 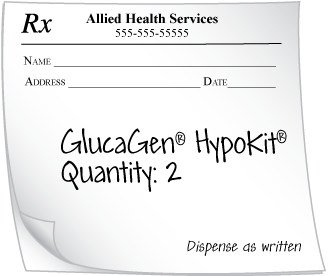 Consider prescribing two kits, so your patients have one GlucaGen® HypoKit® at work and one at home. GlucaGen® (glucagon) for injection 1mg/mL is used to treat severe hypoglycemic (low blood sugar) reactions that may occur in patients with diabetes mellitus treated with insulin. Because GlucaGen® depletes glycogen stores, the patient should be given supplemental carbohydrates as soon as he/she awakens and is able to swallow, especially children or adolescents. Medical evaluation is recommended for all patients who experience severe hypoglycemia. GlucaGen® is contraindicated in patients with pheochromocytoma because GlucaGen® may stimulate the release of catecholamines from the tumor. GlucaGen® should not be administered to patients suspected of having insulinoma. If symptoms of hypoglycemia develop after a dose of GlucaGen®, give glucose orally or intravenously, whichever is most appropriate. Caution should be observed in administering GlucaGen® to patients with glucagonoma. Allergic reactions may occur and include generalized rash, and in some cases anaphylactic shock with breathing difficulties and hypotension. In order for GlucaGen® treatment to reverse hypoglycemia, there must be adequate amounts of glycogen stored in the liver. GlucaGen® should be used with caution in patients with conditions such as prolonged fasting, starvation, adrenal insufficiency, or chronic hypoglycemia because these conditions result in low levels of releasable glucose in the liver and an inadequate reversal of hypoglycemia by GlucaGen® treatment. Necrolytic Migratory Erythema (NME), a skin rash, has been reported postmarketing following continuous glucagon infusion and resolved with discontinuation of the glucagon. Should NME occur, consider whether the benefits of continuous glucagon infusion outweigh the risks. Caution should be observed when GlucaGen® is used as an adjunct in endoscopic or radiographic procedures to inhibit gastrointestinal motility in patients with known cardiac disease. Nausea and vomiting may occur, especially with doses above 1 mg or with rapid injection. A temporary increase in both blood pressure and pulse rate may occur after GlucaGen® administration. Beta-blockers may cause a greater increase in both pulse and blood pressure after administration of GlucaGen®. Indomethacin: When used with indomethacin, glucagon may lose its ability to raise blood glucose or may even produce hypoglycemia. Anticholinergic Drugs: Coadministration with an anticholinergic drug is not recommended due to increased gastrointestinal side effects. Warfarin: Glucagon may increase the anticoagulant effect of warfarin. Insulin: Insulin reacts antagonistically towards glucagon. Pregnancy and Nursing Mothers: There are no adequate and wellcontrolled studies in pregnant women. Glucagon does not cross the human placenta barrier. It is unknown whether drug is excreted in human milk, therefore caution should be exercised. Pediatric Use: The use of glucagon in pediatric patients has been reported to be safe and effective. GlucaGen [package insert]. Plainsboro, NJ: Novo Nordisk Inc; July, 2018. This website is intended for US Health Care Professionals. Non-US Health Care Professionals, please go to novonordiskpro.com.